All of our Picture Frames are on Sale 45% Off - from NOW through Friday April 19, 2019! Each picture frame includes stretcher bars. 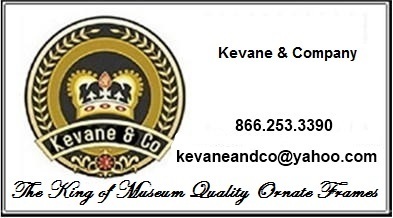 Kevane & Company has scowered the world to find the best possible value in Wooden Frames for Oil paintings and Watercolors. We have also organized our Picture Frame Collection by Size. Please visit our page of Picture Frames By Size. ALL of our Picture Frames are discounted 40% EVERY DAY OF THE YEAR! This makes Kevane and Company the best place on earth to find high quality wooden picture frames for your oil paintings or all the rest of your art. All of our Picture Frames are on Sale 45% Off - on Sale from Now until Friday April 19, 2019! All of our Custom Ornate Frames are on sale 45% Off from now until Friday April 19, 2019!